Refrigerated trucks must maintain a cool temperature in order to avoid damaging the products that they carry. Optimizing the insulation materials and cooling systems of these vehicles is therefore an important step in their design. 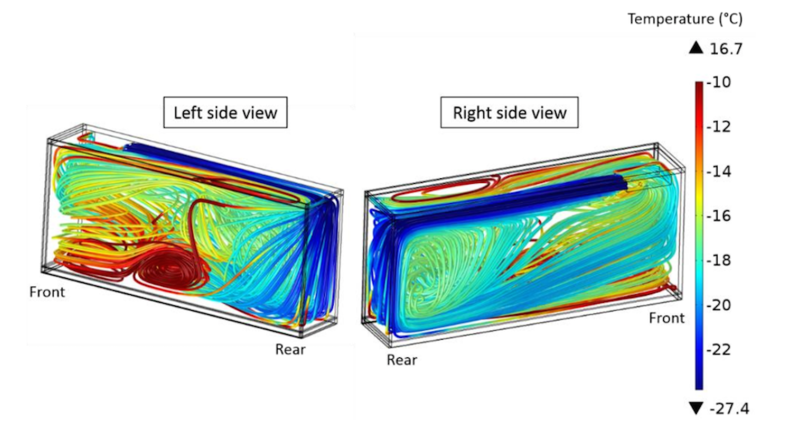 To ensure that such components work effectively under open- and closed-door cycles, Air Liquide teamed up with SIMTEC, a COMSOL Certified Consultant, to perform heat transfer and CFD simulations with the COMSOL Multiphysics® software. In order to transport food and other perishables, refrigerated trucks are designed to maintain a cold temperature. If these products are not kept properly cooled, they can become heated above an acceptable temperature and thus harmed while in-transit. This is especially true in cases where products are exposed to heat for a prolonged period of time. While it may seem straightforward to keep a truck properly cooled, there are a few important elements to consider. For one, the cooling system’s design must be optimized in order to preserve the correct temperature. Additionally, the truck’s walls need to be sufficiently insulated to help maintain this desired temperature, which requires choosing the right materials for the job. Now consider when goods are loaded or unloaded from the truck. 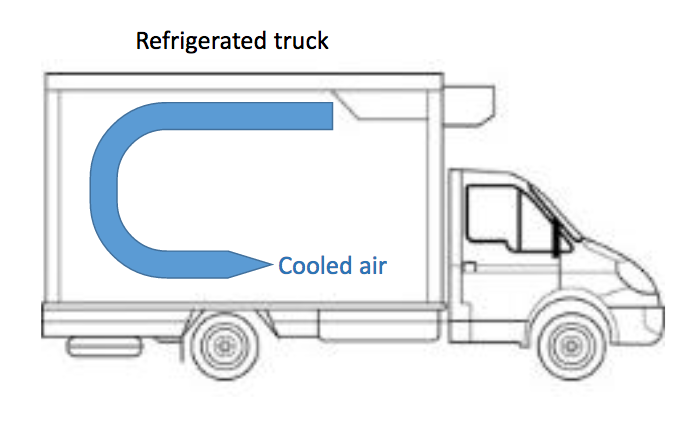 The open- and closed-door cycles that refrigerated trucks undergo makes addressing the above elements even more challenging. It is, however, important to address these periods in order to obtain realistic results for the vehicle’s cooling efficiency. Let’s see how SIMTEC, a COMSOL Certified Consultant, helped Air Liquide, a leader in technologies, gases, and services for industries and health, model this process. When it comes to choosing the best thermal insulation materials for an efficient air-cooling system, it is important to have a thorough understanding of the aerothermal configuration inside a truck’s refrigerated box. As we’ll demonstrate here, this can be achieved by coupling CFD and heat transfer in COMSOL Multiphysics. 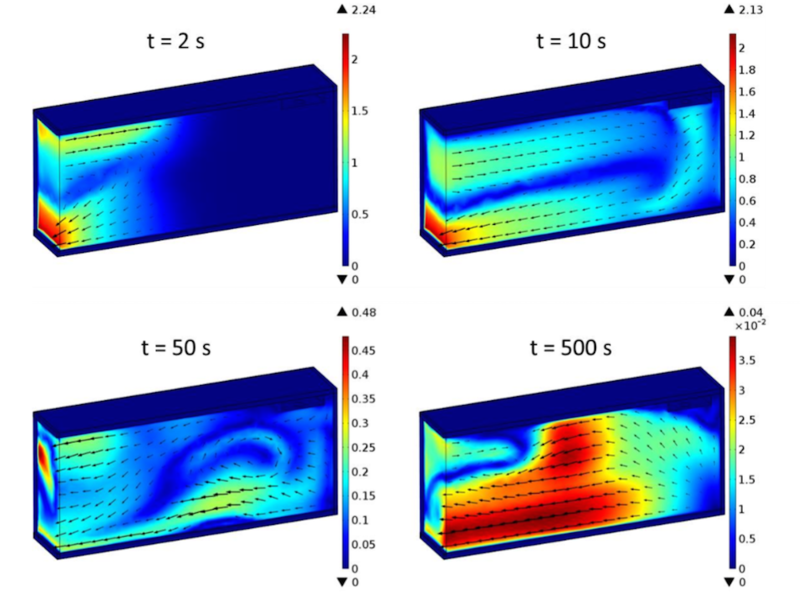 For their simulation studies, the team at SIMTEC created an aerothermal model to simulate heat transfer during the normal operation of a refrigerated truck. Their goal: Predict the temperature and air velocity distribution inside the truck and find out what happens upon closing and opening the rear door. We can begin by taking a closer look at their model geometry. The engineers modeled the refrigerated area of the truck (the refrigerated box) as a parallelepipedic box with a cooling system. The cooling system is comprised of two circular apertures used for air extraction and a rectangular aperture used to blow refrigerated air into the main box. Since the model geometry features a y–z symmetry, it is possible to fully describe the physical phenomena occurring in the entire refrigerated compartment by using only a model of half of the box. Geometry of the refrigerated truck. The entire refrigerated box geometry, the half-box geometry, and a close-up view of the ventilation and cooling system are shown. Image by Alexandre Oury, Patrick Namy, and Mohammed Youbi-Idrissi and taken from their COMSOL Conference 2015 Grenoble presentation. For their analyses, the team investigated two stages of a refrigerated truck’s operating cycle, using two different computational methods to predict temperature and air flow distribution. 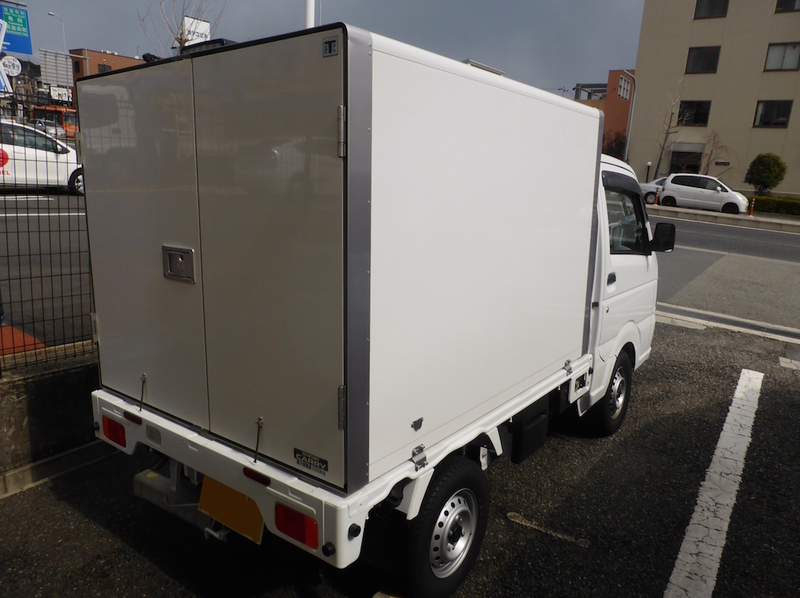 In the first stage, which lasts for about three hours, the truck’s rear door is closed and the cooling system is turned on. Both the fans and refrigerating unit operate in order to cool the refrigerated box. The air from the refrigerating system is initially at a temperature of -27°C and later heats up when coming into contact with the warmer box walls. During this cooling period, the engineers partially decoupled their simulations to minimize the system’s degrees of freedom. Cool air moving through a refrigerated truck with its rear door closed. Image by Alexandre Oury, Patrick Namy, and Mohammed Youbi-Idrissi and taken from their COMSOL Conference 2015 Grenoble presentation. In the second stage, which lasts around ten minutes, the truck’s rear door is opened after the cooling period, and both the refrigerating unit and ventilation system are switched off. Unlike the first stage, this step fully couples CFD and heat transfer to solve the laminar CFD and heat transfer equations. The team then used these equations to analyze the airflow into the box as well as the temperature change during this time period. How Does Opening and Closing a Door Affect a Refrigerated Truck? To answer this question, let’s begin by looking at the simulation findings from the first stage, when the truck’s rear door is closed. The figure below illustrates an air flow streamline of the local velocity after 10,000 seconds (approximately 2 hours and 45 minutes). At this point in time, the air reaches its maximum velocity at the roof of the box facing the inlet and along the door wall. The velocity decreases rapidly as the air flows through the rest of the box. Streamlines showing the air’s local velocity after 10,000 seconds in the closed-door stage. Image by Alexandre Oury, Patrick Namy, and Mohammed Youbi-Idrissi and taken from their COMSOL Conference 2015 Grenoble paper. The temperature field has a very similar distribution to the air velocity, with the coldest areas corresponding to high-velocity regions and vice versa. The plot below indicates that the warmest region is the recirculation zone located at the bottom of the box, where the air is greater than 0°C. Streamlines showing the air flow’s local temperature after 10,000 seconds in the closed-door stage. Image by Alexandre Oury, Patrick Namy, and Mohammed Youbi-Idrissi and taken from their COMSOL Conference 2015 Grenoble paper. The engineers also calculated the heat losses within the refrigerated box. By doing so, they found that air cools down inside the truck and global heat losses increase over time. Most of the heat is lost through the lateral and rear walls, both of which feature similar loss profiles. Because the floor is composed of the thickest materials and is the most insulated surface, a very limited amount of energy is lost through its surface. 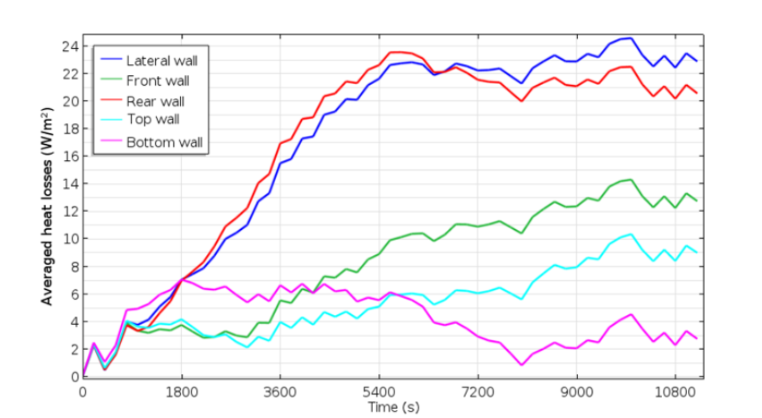 Averaged heat loss for each of the five walls during the closed-door cooling period. Image by Alexandre Oury, Patrick Namy, and Mohammed Youbi-Idrissi and taken from their COMSOL Conference 2015 Grenoble paper. Shifting gears to the second stage… With the cooling and ventilation system both off, the engineers stressed that the only driving force for air is the natural convection caused by the difference between outer and inner air temperatures. Since the temperature within the box is much cooler, warmer air flows into the box. 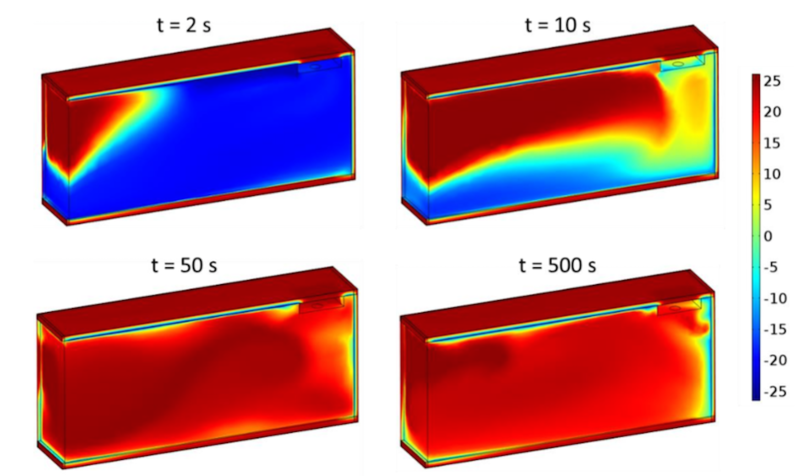 As illustrated in the following simulations, hot air rapidly enters the box at first, but after 50 seconds, the average air velocity drops below 10 cm/s. At 500 seconds, the average air velocity is as low as 2 cm/s, which may be due to the fact the temperature difference between the box and the outside environment is greatly reduced. The average air velocity in the truck box at 2, 10, 50, and 500 seconds after opening the rear door. Images by Alexandre Oury, Patrick Namy, and Mohammed Youbi-Idrissi and taken from their COMSOL Conference 2015 Grenoble paper. As for the temperature, about 10 seconds after the truck’s rear door opens, the temperature for most of the box matches the outside temperature (around 25°C). One exception is the area around the walls, where a thermal inertia helps the surrounding air stay cool. The temperature in the truck box at 2, 10, 50, and 500 seconds after opening the rear door. Images by Alexandre Oury, Patrick Namy, and Mohammed Youbi-Idrissi and taken from their COMSOL Conference 2015 Grenoble paper. The team later compared their thermal simulation results to physical experiments where the rear door of the truck was opened and closed multiple times. They found that the model predictions were in reasonable agreement with the experimental temperatures. The simulation results, however, do show oscillations occurring during the open-door periods that were not observed in the physical experiments. An explanation suggested by the engineers for this is that the temperature was calculated in a different location in the model and physical sensor. Another possible cause is the sensor’s intrinsic inertia, which may have a small leveling effect on the temperature. The model itself shows an instantaneous temperature of air. 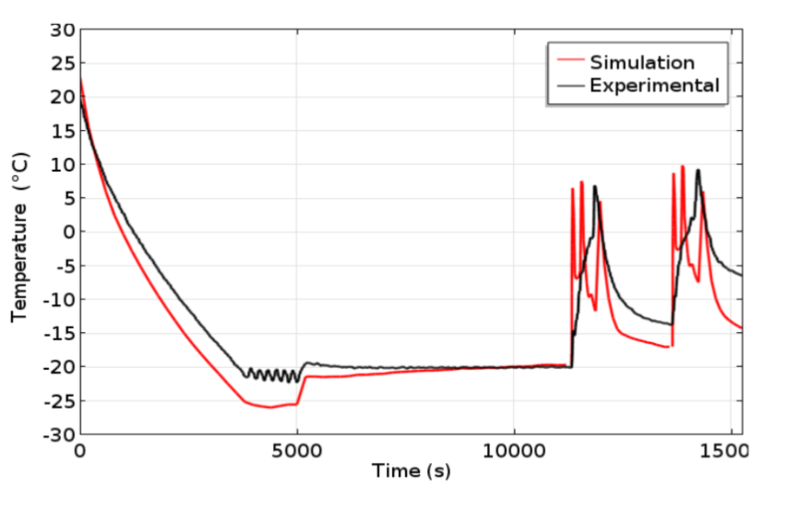 A plot comparing simulation results with experimental data. Image by Alexandre Oury, Patrick Namy, and Mohammed Youbi-Idrissi and taken from their COMSOL Conference 2015 Grenoble presentation. 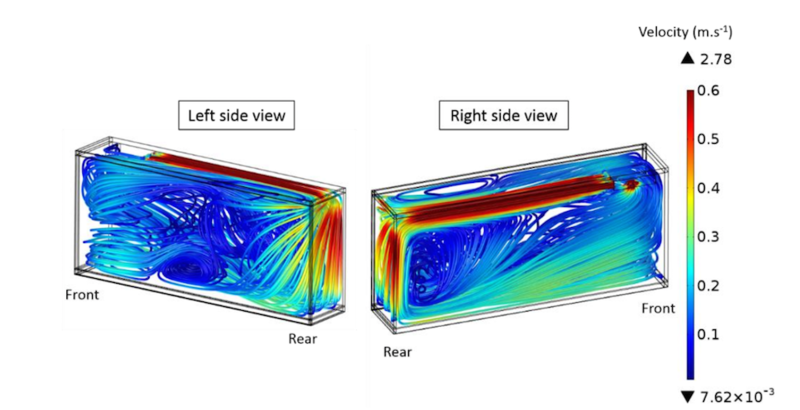 With COMSOL Multiphysics, the team at SIMTEC found it easy to couple turbulent CFD and heat transfer in order to perform aerothermal simulations of a refrigerated truck model. These findings have the potential to serve as a powerful tool for designing the next generation of refrigerated trucks, identifying the optimal materials for their walls and indicating ways to enhance the power specifications and locations of their cooling systems. To learn more about our COMSOL Certified Consultant SIMTEC and their services, visit their website.